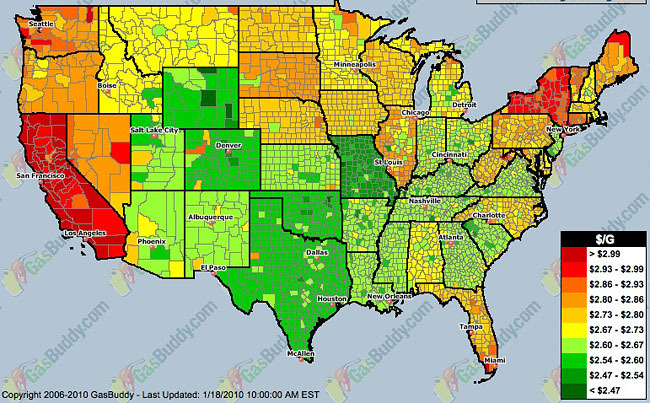 Driving across the country, I have learned which states have better gas prices. If I am headed east on I-70 in eastern Missouri, I always buy gas before I cross the Mississippi River into Illinois where the prices are much higher. I don’t by gas again until I get to Indiana. If I am in western Nebraska on I-76 and headed for Colorado, I try not to buy gas until I get across the Colorado state line. If I am in Pennsylvania on I-84 and headed for New York, I always fill up before crossing the New York state line.